New! American Tooth Industries announces the expansion of their Justi ® Imperial® tooth line. Newly included are the most popular American molds, ∆E12, ∆E22, ∆E32, ∆F42, ∆D55, ∆E, ∆H, ∆N, and 10 degree posteriors: Δ30X, Δ32X, Δ34X and Δ36X. Imperials are now available in 22 shades, ranging from the lightest bleached shade to darker, age related shades. The Justi Imperial Delta Order Form can be found here. Justi Imperial offers an incisal and interproximal blend that gives this beautiful line of teeth the unique ability to absorb and reflect surrounding color. This means more latitude for blending with natural teeth – resulting in less resets due to shade, especially in partial denture cases. For repairs, the Justi Imperial’s special interproximal blend is not only a time saver but a customer pleaser. If you are currently using Dentsply Portrait® IPN® then you should strongly consider Justi Imperial as you are getting premium quality at a much lower cost. Justi Imperial anterior and posterior teeth are available in 22 shades – 17, 18, 19, 20, 21, 25, 35, 45, 50, 59, 60, 62, 64, 65, 66, 67, 68, 69, 70, 77, 81 and 82. Justi Imperial molds include 44 upper anteriors, 13 lower anteriors, 25 upper and 25 lower posteriors. The tooth molds are available in graduated giant, medium, normal and small sizes. They all have good labial anatomy and over-polishing is not a major concern. 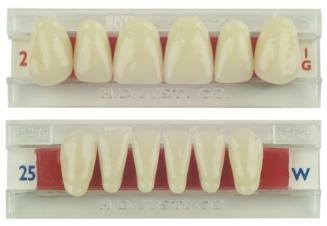 The most sophisticated aesthetics for full dentures can be achieved by using Types 9, 10 and 12 molds. They are specifically designed for minimum difficulty in full denture set up. Type 1 molds are great for partial work because they have a wide neck and almost parallel sides which provides for adequate gingival coverage. They also feature an extended range of sizes: three giant sizes (1G, 5G, 9G) and three tiny sizes (1T, 5T, 9T). There are also anatomically shaped lower molds; YL, VL, YS, VS and very large lowers such as Mold U. The Justi Imperial posteriors are available in 33 degree, 20 degree, 10 degree and 0 degree occlusal forms – also in all 22 shades. For the close bite case, which always requires additional grinding, there are three sort sizes: 30S, 32S and 34S, which are short on the lingual and long on the buccal for good natural aesthetics. This feature is sought after by experienced denture technicians, and is virtually exclusive to the Justi Imperial line. The Justi Imperial Order Form can be found here. There are two different shade guides available for this tooth line. 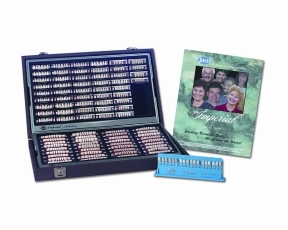 The Justi Imperial Maxillary Centrals Shade Guide displays twelve of the most popular blended shades in centrals only. It is affordably packaged in an optically neutral light blue frame with an Eterna shield and a Kroma tab which allows the technician to view the teeth on a neutral background. This shade guide can be customized with the name of a laboratory or clinic, as well as a marketing message. The Justi Imperial Eterna Shade Guide is presented in an Eterna shield and holds all eighteen blended shades of this beautiful tooth line. Each shade of the guide has a central, a lateral and a cuspid which are in the same hue but in different “tones”, thereby creating a natural blended effect. It is recommended that the shade guide be disinfected by soaking in an acid or alkaline glutaraldehyde solution. Justi Imperial teeth are made according to ADA Specification #15 for artificial resin teeth. The teeth are photogenic, vacuum-processed and are 100% guaranteed to be bondable to methyl-methacrylate denture base materials. All Justi tooth lines can be professionally cleaned using Renew Denture Cleaner.